CD review: "Esteban Salas: Cuban Baroque Sacred Music"
This review first appeared in the June 13, 1997 issue of the North County Times. When one thinks of Cuban music, it's usually congas and timbales, salsa and son, Desi and Tito. That's one side of Cuban music, and a good one at that. But there's another, lesser-known side of Cuba's musical heritage  the 18th century composer Esteban Salas. Salas, a parish priest and choir master in both Havana and Santiago de Cuba, has been practically unknown  which is tragic given the quality of the music presented on two recent CDs. The second release, "Cuban Baroque Sacred Music," contains two full Masses plus five other sacred compositions. (Last year saw the release of the first collection of Salas' work, "Cuban Baroque Music of the 18th Century.") 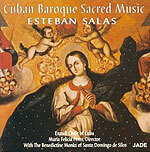 As performed by the Exaudi Choir of Cuba, Salas' sacred compositions are shown to be the equal of his European contemporaries. Alternating between soaring tributes to God and contemplative hymns, Salas' work is wonderously spiritual and moving. The real miracle is that such a recording could have been made under a regime as vehemently (and often viciously) as anti-religious as the Castro dictatorship.